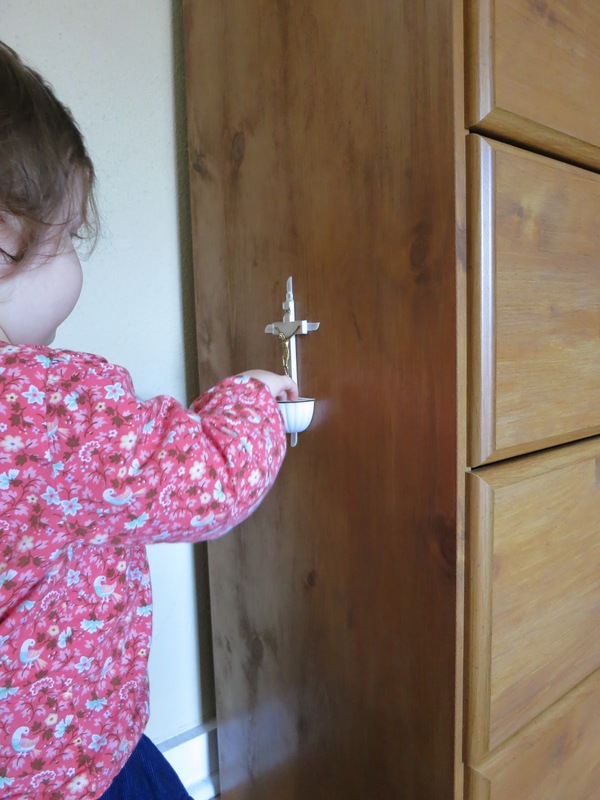 When her daddy leaves for work in the morning, he gives Lucy a blessing with holy water. 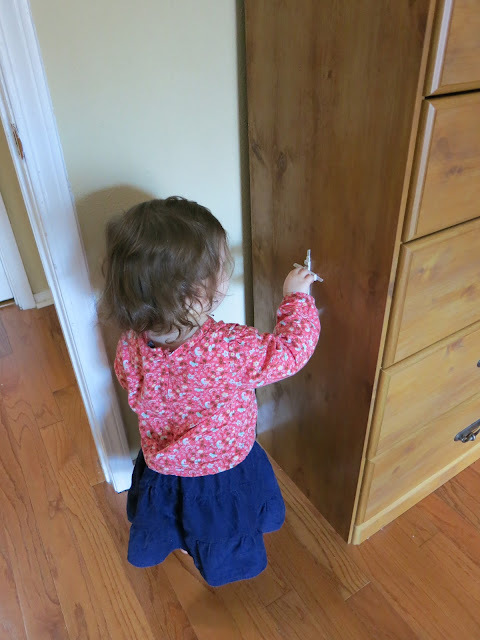 She has come to know and love this routine, and some mornings even asks for it (the mornings when she isn't crying because Daddy has to leave) by running over toward the door and putting her hand to her forehead. At Mass last Sunday, Daddy was holding her. 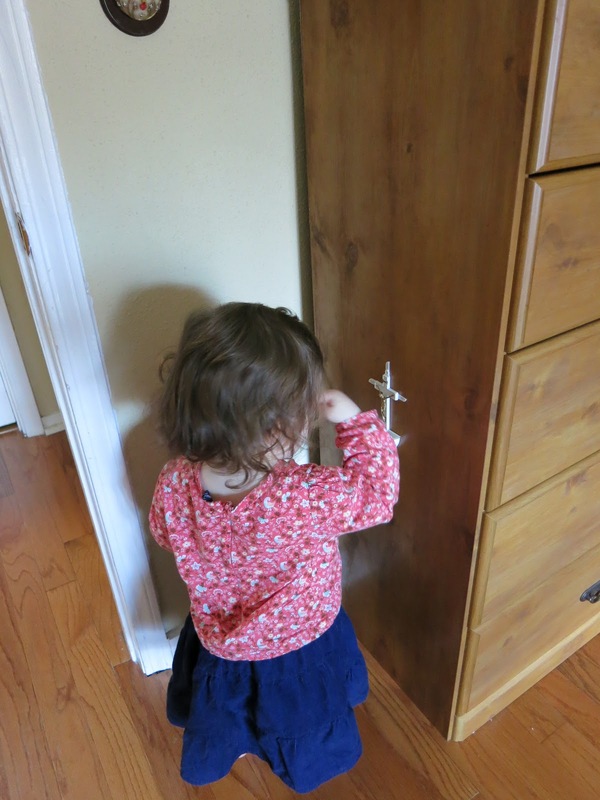 When the time came for the blessing at the end of Mass, Daddy told Lucy, "The priest is about to give us a blessing." She turned right around and put her hand to her forehead. On February 2, we were able to go to Mass. At the particular chapel where we were, the holy water fonts are just a little lower than average. Lucy discovered that she could reach them, and spend the last five minutes of Mass blessing herself with holy water. Since she seemed to be so interested, when we got home I found an extra holy water font I had stored away, mounted it at her height, and filled it. After blessing herself until her hair and shirt were quite wet, she had the idea of blessing me. I think I must have been blessed five hundred times with holy water that day. She also blessed Linus a few times. By the end of the day, the font was empty. 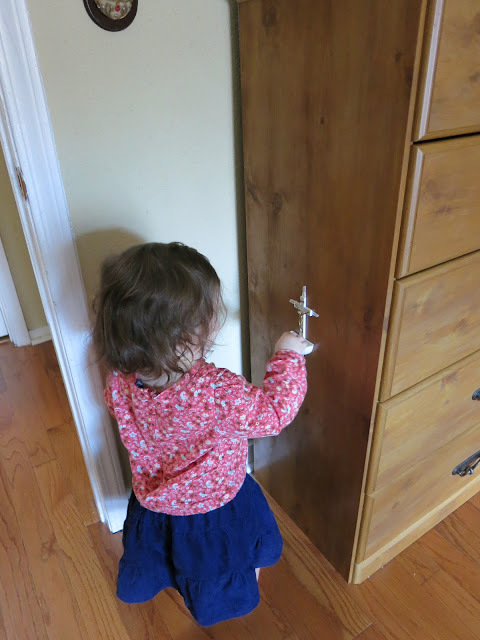 This morning when Daddy gave Lucy her blessing before he left for work, she ran to go get some holy water to bless him.